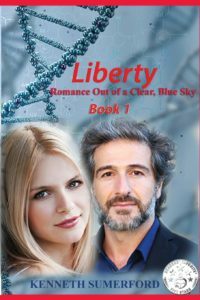 Liberty: Romance Out Of A Clear, Blue Sky by Kenneth Sumerford is a contemporary novel exploring the question of God against the backdrop of a scientific atheist. There is also romance budding. The novel presents both the Biblical aspect and the scientific explanation. I am not a scientist so some of the theories and detail presented went completely over my head. It did not detract from my overall enjoyment though. Delightful Native American tales were included to show their beliefs on creation. They were surprisingly similar to the Christian stance. There was the theme of infidelity… undertaken by both Christian and atheist characters, designed to show that whatever we believe, we all face the same temptations. It all depends on how grounded in God we are, and whether we line up what we are tempted with, with what God says, as to our responses to the situation we face. I was not comfortable with the bed hopping within the novel. Liberty was an entertaining read, not one I always understood but my background is in history and English, not science, but I enjoyed it. I imagine a reader with a scientific background would have an even greater appreciation for the story with its scientific theories. A complex well thought out read. As an aside… God is amazing. He knows just what we need and just when we need it. As some of you may know, my Dad suffered a heart attack and had an emergency angiogram to fit a stent on 15th October. I received Liberty in the summer and it was heading to the top of my TBR pile when all reading was suspended as hospital visiting and then looking after my Dad at our house followed. As I picked up Liberty to read yesterday, imagine my surprise to find a character going through what my Dad went through and having the same reactions. Wow! I needed to read that, and so did my Dad. He was reassured to know that he was not alone in his reactions. So thank you Kenneth Sumerford for sending me your book. And thank you to God, my Father who knew just the right time for me to read this book. To God be the glory. P.S. There were a few tears in my eyes as I read your review. Why? As the author, I enjoy and appreciate reviewers who “get it” and learn from my books.